Authentic Sichuan cuisine with a view- Si Chuan Dou Hua restaurant is located at the one of the most prominent building in the CBD. On the 60th story, this chinese restaurant is a place you want to spend an evening with your business partners or a casual dim sum lunch. This restaurant has been around for a long time and I cannot believe this is my first time dining here. Having read so much about it before, my expectations and excitement to have a taste of the food there was beyond expressions. We were welcomed with warm greetings by the smartly dressed waiters to our table. I tried to reserve for a table near the glass windows but they declined my request saying it is for four diners and above. 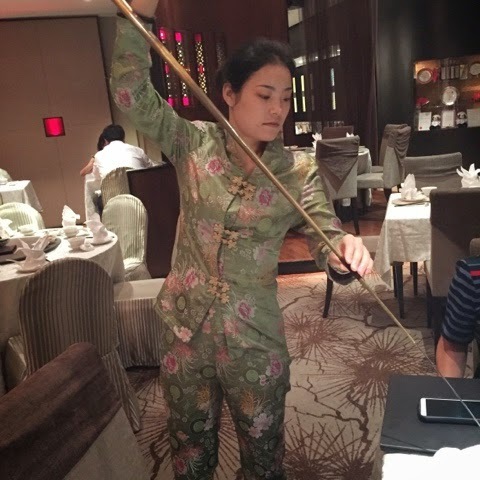 A chinese lady in cheongsum poured tea for us promptly upon settling down. At $6.50 per pax, you get to experience traditional tea pouring and unlimited flow of hot long jin tea.